All special orders have to be renewed annually as long as the delegates wish them in place. Otherwise they automatically expire. The United States faces a crisis of a failing health care system. This crisis is much present in rural communities and takes the form of a population disproportionately uninsured and under insured and with communities facing the loss of local hospitals and other health care services. Many rural community members are self-employed farmers and small business owner-operators who purchase insurance on the individual market for themselves and their families. And as small businesses they are often unable to afford the high priced health insurance for employees. The high costs and rapidly increasing premium rates for good health insurance prices many families out of the market, leaving them with no, or poor quality, health insurance and highly vulnerable, both economically and health wise, to the risk of getting injured or sick. This undermines the economic resilience and viability of existing farms and small businesses and creates a major barrier for the entrance of new farmers and small businesses. The Affordable Care Act (ACA) passed in 2010 provides critical health benefits for the uninsured and under insured. While it reduced the number of uninsured, many still have no health care coverage. The ACA helps many with subsidized insurance premiums, while others not eligible for subsidies confront sky rocketing premium increases. The ACA fails to curb predatory pricing in pharmaceuticals, health insurance, and other health care technology, equipment and services. While the ACA is an important step forward, it is insufficient and unsustainable. The major, so-called health care reforms to dismantle the ACA put forward by congress earlier this year were big steps backwards, threatening to dramatically increase the number of uninsured and accelerate the increasing costs of healthcare. The private health insurance, market-based, system of providing health care is a failure and unworkable in meeting the health care needs of all Americans. The United States is the only one of the developed nations of the world that doesn’t provide a single-payer system of health care. As a result, the per-capita health care costs in the U.S. are on average twice as high as that in the other developed nations, and for most health care outcomes the U.S. ranks among the lowest. Farmers Union has a long history of supporting single-payer health care. Medicare is the single-payer system in the U.S. for seniors and many who are disabled. The administrative apparatus for Medicare is already in place, and most Americans understand and support Medicare. It is time to extend Medicare coverage to all Americans. 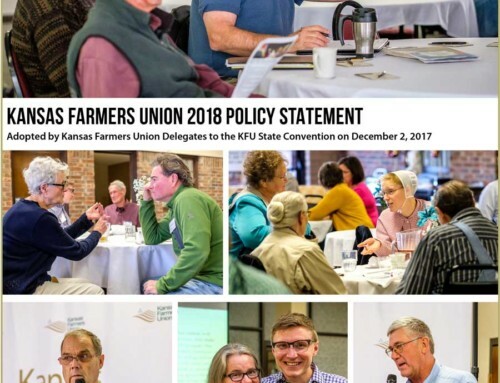 Kansas Farmers Union brings forth this long held policy for single-payer health care as a special order of business to draw attention to the urgent need to address health care in the only way we can that will provide all Americans the high quality, affordable health care they need and deserve. 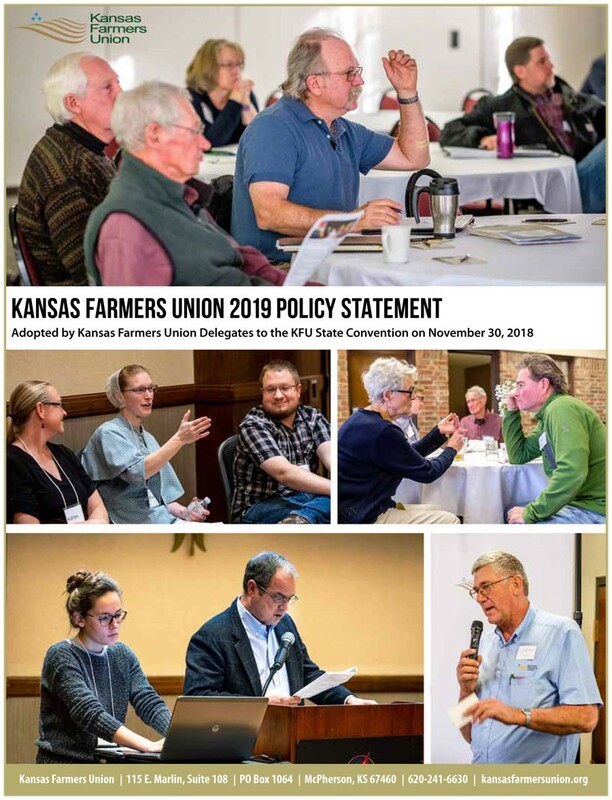 Kansas Farmers Union urges the U.S. Congress and Senate to hold hearings, pass legislation and begin the process of extending Medicare to all Americans. We urge our state legislature to hold hearings on single-payer health care as a way to educate our own citizens and apply pressure to our federal government to adopt single-payer health care. We ask all other farm and environmental organizations, church institutions, local business associations, community groups, non-profit organizations, labor unions and private citizens to educate, organize and advocate for the single-payer health care system we all need and deserve. The 2018 annual convention of the Kansas Farmers Union believes the unprecedented, all-time low commodity prices have created undue stress on individuals, families, communities, and the economy. We urge immediate action by the Kansas Legislature to enact legislation creating a program similar to the highly successful Farmers Assistance Counseling and Training Services (FACTS) program of the 1980s. 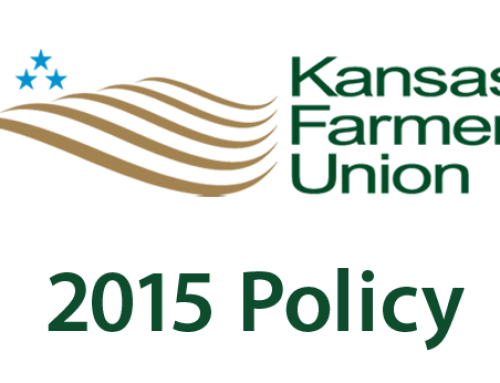 The 2018 annual convention of the Kansas Farmers Union believes mental health issues demand our immediate attention and vigorous support. The state of Kansas has a long history of a government supported mental health system. We support expanded mental health services. We oppose efforts in Kansas to privatize public mental health services, particularly the state mental health facilities. The degree to which we embrace and support those with mental health issues is a reflection of our character and resolve to maintain and grow healthy communities. We urge the Kansas Legislature to expand Medicaid and rural healthcare services. Continued lack of action leads to the decline and depopulation of our great state. One rural hospital recently closed, and others are struggling. Any further delay in implementing Medicaid expansion in Kansas only contributes to the accelerated economic decay of the rural healthcare infrastructure of the state. As delegates of the 2018 Kansas Farmers Union convention, we are compelled to address the state of our rural economy, farms, and communities. Unbridled production, coupled with above average crop yields in most areas, have filled terminal and local grain facilities to overflowing, resulting in millions of bushels of grain piled on the ground. This burdensome surplus has driven the parity ratio to historic new low levels. The commodities we produce serve as our currency. Devaluation due to reckless over-production has led to continued, rapid burn rates of assets and working capital. Rural communities, economies, farms and businesses continue to be cannibalized from within. The grain trade, processors, input suppliers, and commodity check-off organizations continue to promote and encourage this misguided policy, as they all stand to profit from rampant over production and exploitation of human and natural resources. 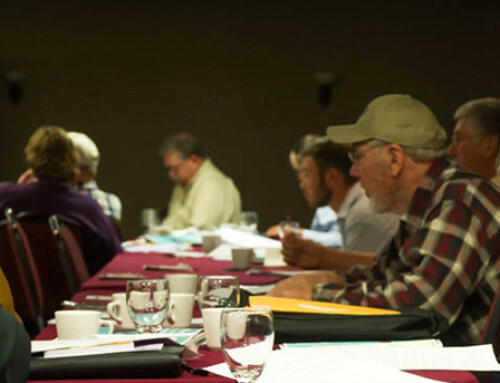 We believe a program of supply management and a publicly-funded farmer owned reserve should be implemented. Farmers and ranchers remain on the front lines as stewards of our natural resources, environment, and food supply. We must embolden our collective consciousness for the common good, as well as the good of the commons. The Bailey camp represents the legacy of those who came before us and future generations. Kansas Farmers Union supports the NFUE in Bailey, Colorado. We support all aspects of the National Farmers Union Youth and Education program and continue full utilization of our Bailey Camp facilities so it is available for our present and future Farmers Union membership. We recognize and respect all the dedicated efforts that went into making our educational center a reality by thousands of loyal Farmers Union members across the United States. In the case of a sale of the facility the funds should be put into a permanent educational endowment fund. Student loan debt has become one of the most significant challenges our nation’s young farmers and ranchers face. With sixty-three percent (63%) of farmland on the cusp of transition to the next generation, growing a new generation of farmers is critical. Farming provides a public service. Just as our country has provided incentives for Americans to enter medicine, education, and other public service careers, we need to encourage young people to choose careers in agriculture. Farmers, like nurses, teachers, government employees, and non-profit workers, should qualify for the public service loan forgiveness program. 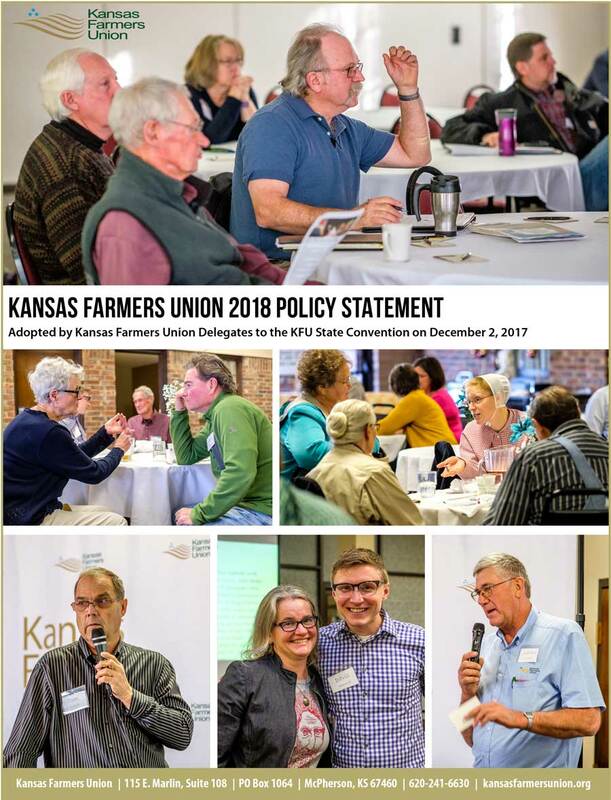 Kansas Farmers Union empowers and engages family farmers, ranchers, and communities through organization, education, cooperation and legislation. 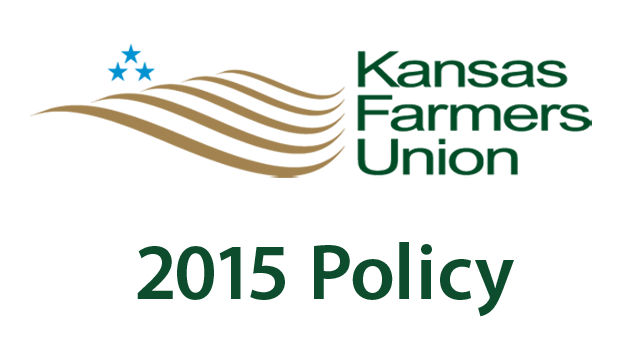 The Kansas Farmers Union takes pride in defining our policy. We believe policy should address the needs of people. The moral and ethical decisions made by individuals and governments have an impact on our daily lives, and on the lives of future generations. Recognizing that fact, our policy strives to assure those decisions maintain a just and ethical basis. Our policy also addresses the use of our natural resources and environment with the same fervor. We must not allow greed, ignorance, or carelessness to bring about exploitation of our natural resources, or of our fellow man. We believe family ownership and maintaining family farms will preserve natural and human resources, and contribute to climate stability. A policy of parity prices, fair trade, and humanitarian aid should be established by our country and promoted around the world. We support the following guidelines for a farm policy to enhance agriculture and communities.Limiting corporate power, strengthening democracy, and supporting human development. 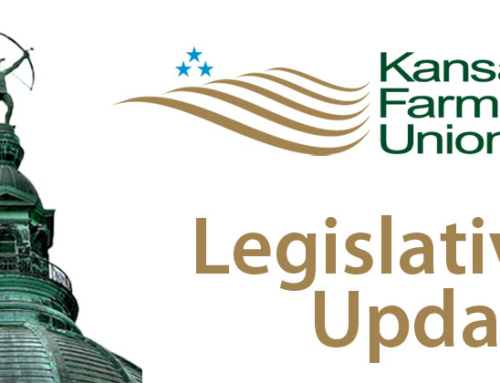 Kansas Farmers Union opposes efforts to dismantle the Farm Service Agency (FSA) delivery system through office closures, elimination of county office positions, or change employees’ classification to civil service. We support adequate funding and staffing to support the FSA service centers. We support the continuation of farmer-elected committees and strongly oppose any effort to reduce the number of such committees or any attempt to make the position of committee person appointed. We oppose the formation of any national oversight committee which supersedes state or county committee jurisdictions. Farm program benefits should be limited to family farmers. We urge congress and the administration to re-negotiate trade agreements to prioritize and support human development. We oppose “Trade Promotion Authority” that circumvents the ability of Congress to negotiate trade agreements. We oppose the fast-track authority for trade agreements/approval by Congress and that those should be fully aired and debated. Trade agreements should reflect the need to limit corporate power, strengthen democracy, and promote human development. We support the P.L. 480 Peace and Economic Justice for All. We support a federal premium subsidy of at least fifty percent (50%) for all levels of coverage. Yields should be based on APH (Actual Production History) over a 5-year period. FSA yields should be updated to reflect the true county averages. We urge a minimum level of multi-peril crop insurance (50%) be provided as a benefit of farm program participation to traditional family farm sized units. We support subsidy limits on crop insurance premiums, coupled with conservation compliance. We support limiting crop insurance premium subsidies for any single business entity or individual to $75,000. We support continuation of disaster programs until such time as crop insurance is fully a functional alternative. Whenever a natural disaster strikes, destroying any programmed crops, affected producers should receive a loan deficiency payment (LDP) based on the county average yield. We oppose the USDA Risk Management Agency allowing premium discounts promoting the use of specific crop inputs and/or farm equipment. We support full disclosure of crop insurance subsidy payments received by participants in the crop insurance program. Crop insurance coverage regions should reflect feasibility of crop production in the region. Conservation Reserve Program (CRP) ground should be ineligible for receiving crop insurance until five years of crop production history has been established or be subject to approval by the Natural Resources Conservation Service (NRCS) county committee. We support the development and expansion of products that allow producers of non-program commodities, diversified farming operations of specialty and minor crops to have equitable insurance coverage based on the market for which it is produced. We support the Livestock Gross Margin program. We support overhaul or replacement of the Margin Protection Program (MPP-Dairy) with a program that protects family dairy farms from price volatility. We support structuring crop insurance for food crops. Crop insurance programs should support the use of cover crops and not penalize such use. Provide incentives for a more decentralized food system, processing and packing industries. .
Ban imports of live animals and processed meat without documented labeling and verification. Remove all meat protein products and by-products from feed of all species, including poultry. Implement a voluntary, affordable and workable national animal identification program implemented and administered by the federal government, and not by a private entity. Implement a fully-funded Country-of-Origin-Labeling (COOL) program. Ingredient labeling of processed feedstuffs. Review the food processing system and add additional inspection. Provide incentives for a more decentralized packing industry and food system. We support continued funding for farmer education programs concerning food safety. We support full public disclosure of all GMO ingredients through food labels. We support compensation, by the patent holder, of producers experiencing income losses due to drift and cross-contamination. We support protection of traditional crop genetics. We support the enforced United States Department of Agriculture (USDA) inspection of all imported foods to meet the same requirements as inspected products in the United States. We believe that in order for meat to be labeled a United States product, it must be bred, born, raised, processed, and packaged in the United States. We oppose any reduction of import quotas on dairy products. All livestock entering the U.S. must be held in quarantine until such time there is proof positive the imported stock is disease free. We oppose a ban on the slaughter of unwanted horses and other meat species, and the criminalization of individuals processing, shipping, transporting, purchasing, selling, delivering, or receiving any meat, flesh, or carcass for the purpose of harvest. We call for the reinstitution of facilities to deal with the humane disposal of horses. We support federal legislation to allow the smaller independent meat packers, who meet state meat inspection standards, to market inter-state. We encourage the Kansas Department of Agriculture (KDA) to fully implement and allow interstate shipment of state inspected meat. We urge all educational institutions to pursue research and education to support sustainable agricultural endeavors including, but not limited to, organic farming, local food and sustainable regenerative agriculture practices and cooperate with other entities doing such research and education. A significant portion of agricultural research conducted at public institutions is funded by the private sector. The names of non-taxpayer funding sources must be available to the general public upon demand. We demand the strict enforcement of the anti-trust laws. We fully support the Kansas Legislature establishing a comprehensive Producer’s Protection Act. We also call for state and federal legislation that would require binding mediation in the events of disputes between growers or their organizations and contracted processors or marketers. We support legislation to abolish packer/feeder combinations that control more than two percent (2%) of the market share. The County Option, the last remaining protection of citizens’ rights when it comes to corporate agriculture, must be preserved and protected. Kansas counties should be able to opt out of consideration by any corporation looking to relocate to the state. We also believe Kansas citizens should be able to petition registered voters and bring corporate farming issues to a public vote. We support the “Agricultural Foreign Investment Disclosure Act” (AFIDA). We believe the county option should be preserved in Kansas’ corporate farming laws. For over 80 years, corporate farming laws have protected family farms and ranches from the threats of unfair competition by corporate and foreign interests, and all-out repeal threatens the future of family agriculture across Kansas. The county option, the last remaining protection of citizens’ rights when it comes to corporate agriculture, must be preserved and protected. We find it very disconcerting that both elected and appointed officials, who have touted the virtues of local political control and smaller government, now feel the need to take away this last protection. We believe Kansas counties should be able to opt out of consideration by any corporation looking to relocate to the state. We also believe Kansas citizens should be able to petition registered voters and bring corporate farming issues to a public vote. We believe Kansas is better off when those who own and work the state’s farms and ranches are individuals and families who have the opportunity to control their own land and labor, and a desire to create a future for family farming and ranching, and for all of rural Kansas, that is socially just, economically equitable, and environmentally sound. Family farms and ranches are the foundation that built this state, and they continue to drive and lead its economy. We believe Kansas’ family farmers and ranchers should expect every protection the state can provide. The Kansas Farmers Union has a long history in support of the USPS, including rural free delivery of mail. We are deeply concerned with the systematic dismantling of the postal service structure, based on fiscal pressure unduly inflicted upon the USPS by Congress. Recent operational restructuring has curtailed service across the nation, particularly in rural areas. Rural residents depend heavily on the USPS for daily business transactions, communications, and as a vehicle for growth of the rural economy. We believe the 2006 Postal Accountability and Enhancement Act requiring the institution to pre-fund retiree pension funds decades in advance is unwarranted and the primary culprit in the financial issues facing the USPS. We urge congress to restore adequate funding to the United States Postal Service. We also urge expansion of USPS services including, but not limited to, postal savings banks. The potential elimination of Saturday and door-to-door delivery, coupled with the loss of good-paying postal jobs over the entire nation, will negatively affect the economy. Rural America will be dealt an additional first class blow under this misguided policy. Local and regional newspaper delivery to outlying areas will be delayed for days. This not only damages the circulation numbers of the newspapers, but also devalues local information and advertising. The USPS was established in the Constitution, Article I, Section 8, Clause 7, congress shall have the power to establish post offices and post roads.” We stand firm in our conviction to protect this great freedom and commonwealth from attacks and privatization. Transfer regulatory authority of the Commodity Futures Trading Commission (CFTC) to the Security Exchange Commission (SEC). Support regulations that maintain prices above the cost of production. We oppose ag commodity options as a substitute for farm programs. We are opposed to any government involvement in ag options or futures trading as a substitute for or in conjunction with farm programs. We oppose any speculative trading of commodities futures by any foreign governments, companies or individuals. All commodities sold on futures or options shall be treated as a positive sale and taxed the same as any ordinary sale of the same commodity. We support legislation requiring all speculative futures contracts to be assessed any federal check-off. We support the elimination of speculative short selling of commodity futures contracts. We recommend that the percentage of allowable dockage be reduced. We support legislation to prohibit adding foreign material to any commodity. Kansas Farmers Union requests that the state of Kansas require that the grain trade give equal credit to grain that exceeds the standard weight in direct proportion to the discount for grain under standard weight. We oppose privatization of the Federal Grain Inspection Service (FGIS). We support full funding of GIPSA, and the critical services provided to our nation’s farmers, ranchers, and consumers. We oppose any effort to privatize the inspection and weighing of grains exported from the United States. We support the principle of the progressive income tax. The Kansas Farmers Union supports the phase-out of all tax preferences that made agriculture a tax shelter for outside, speculative investment. We recommend a change in the federal income tax laws to eliminate income tax liabilities of forced liquidations. Road tax on farm fuels should be exempt at point of sale. We support the continuation of the deduction of state and local property taxes from federal tax returns. We support income tax averaging for family farmers. We support increasing the number of tax brackets to facilitate a more equitable tax structure. We support the tax incentives to encourage the use of wind, solar and other renewable energy systems. Individuals should be allowed the same health insurance deductions as corporations. We support increasing the income limit on calculating social security tax. We support continuation of an estate tax with a five million dollar ($5,000,000) exemption. We support a balanced approach to the use of income, property, and sales tax for funding state and local government. We support the elimination of the sales tax on groceries. We support a state-wide property tax in conjunction with an income booster tax, to supplement education funding, and provide local property tax relief. We oppose an increase of state sales tax. We recommend a graduated state income tax. We support the reinstatement of a fair and progressive state income tax. We oppose the elimination of the corporate income tax. We support exempting road tax on farm fuel at the point of sale in lieu of refund. We are in favor of the current homestead property tax exemption and we support its increase to twenty-five thousand dollars ($25,000). 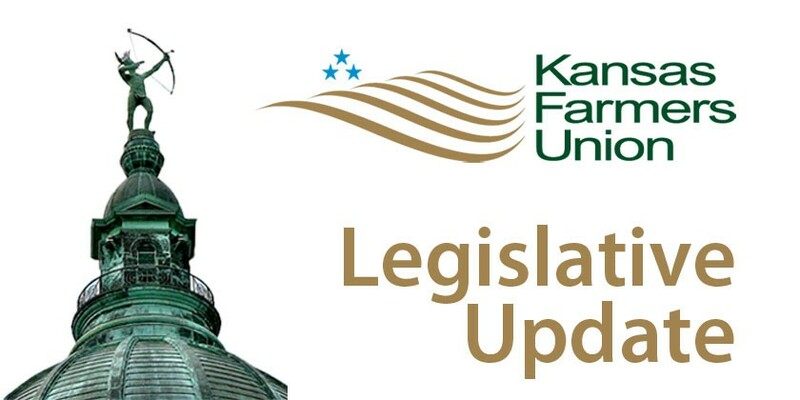 The Kansas Farmers Union supports the continuation of a mineral production tax on oil, gas, salt and coal to provide additional funding needed for school financing and road and highway construction and maintenance. We oppose the 10 year property tax exemption on pipelines. We support a fair and reasonable tax on personal property. We support a state-wide intangible earnings tax to be used for property tax relief and funding education. We urge the reinstatement of the double exemption for individuals over the age of 65. We support an estate tax with a five million dollar ($5,000,000) exemption. The Social Security fund should be held in its own entity and not be used to finance other government operations. To be viable and assure benefits into the future, Social Security must be a mandatory, universal system. We oppose proposals that would privatize any segment of the system. We support the removal of the income limit subject to social security taxation. We demand meaningful campaign finance reform, specifically public funding of congressional and presidential campaigns. We oppose the use of “soft” money (super political action committees, also referred to as super PACs) in campaigns. We support reversal of the “Citizens United” U.S. Supreme Court decision. We support full, timely disclosure of all campaign finance sources. We believe that mandatory checkoff programs promote surplus production and exploitation of human and natural resources. We support the elimination of all mandatory checkoff programs. We call for audits investigating the use of check-off funds to promote political agendas. Fraud and abuse of check-off resources and/or money must be prosecuted to the fullest extent of the law. All check-off programs must be subject to a referendum vote by mail ballot every three years. We believe check-offs are conflicting by design, which offsets other check-off efforts. No check-off funds should be used to the detriment of another agricultural commodity, farmer, or rancher. We accept voluntary check-offs at point of sale. The Federal Deposit Insurance Corporation (FDIC) should not have authority to “classify” loans due to reduction of land values. We oppose any federal effort to eliminate Chapter 12 bankruptcy and any other action to further lessen a borrower’s rights. We support the right of mandatory mediation to prevent bankruptcy. We support full permanent USDA funding of the state mediation programs. We support conservation as the major effort to reduce energy requirements. We support the research and development of renewable energy resources such as solar, geothermal, wind, hydrogen, ethanol, biodiesel and algae with emphasis on community-owned generated power. Federal and state low-interest loans and tax credits should be made available for these and other programs to develop energy self-sufficiency. We urge producers to adopt farming practices and crop mixes that will permit efficient utilization of locally produced fuels and nitrogen fertilizers, thereby reducing agricultural dependence on the petroleum industry. We favor rationing of fuel if needed. We are opposed to excessive taxes and/or price increases to control fuel use. We favor the abolition of take-or-pay contracts. We oppose the deregulation of natural gas prices. We support a resilient expanded electrical grid system that allows for dependable transmission nationwide. We support securing 25% of the nation’s energy utilization from renewable sources by 2025 (25×25). We are opposed to retail wheeling and deregulation of energy. We support C-BED (Community-Based Energy Development). We support net metering of electricity, with a 12-month averaging period. We support storage of energy from renewable generation. We support the renewable portfolio standard established by the Kansas Renewable Standards Act. We support renewal of the National Renewable Energy Production Tax Credit. We oppose discriminatory utility rates for customers who generate renewable energy. We support a moratorium on hydraulic fracturing operations in oil and gas recovery until an environmental impact study, guided by sound science, proves the activities safe. We oppose any effort to “privatize” the REA system. We strongly oppose loss of rural electric territory to investor owned power companies. We urge rural electric cooperatives to investigate and take steps to enter into renewable energy production. We urge the continuation and further development of reasonable priced, state of the art telecommunication service to rural customers. We oppose consolidation of telecommunication providers. We support net neutrality of the internet. We support health care as a basic human right, and using a We support health care as a basic human right, and using a single-payer health insurance system. Health care coverage must be comprehensive and there should be public education to promote healthier lifestyle choices. Until such time as universal single-payer coverage is enacted, we support a one hundred percent (100%) tax deduction for health insurance premium paid by the self-employed, and we support equalization of Medicare payments to rural and urban hospitals alike. We support incentives for the purpose of encouraging doctors and other health care professionals to practice in rural and other under-served areas. Those who receive aid to practice in Kansas for a specified period of time should be required to fulfill their obligation. We support prescription coverage under the Medicare and Medicaid systems. We oppose the sale of Kansas Blue Cross-Blue Shield. We support Medicaid expansion in Kansas, and we oppose any of the initiatives to privatize Medicare. We oppose privatization of the state mental health system. We support the legalization of medical marijuana. We urge the revitalization of our nation’s passenger and freight railroad system. We oppose the closing of branch rail lines, which serve rural communities. We oppose the deregulation of all non-competitive transportation enterprises. We support the retention and expansion of existing Amtrak routes in Kansas and across the nation. We oppose all coal slurry pipelines. We oppose the cumbersome IRS regulation requiring farmers to log farm cars, pickup and truck mileage. We oppose foreign ownership of domestic railroad lines. We oppose the privatization of highways and bridges used in the agricultural transportation system. We oppose the construction of the Keystone XL Pipeline. We support increasing the transportation trust fund through higher gasoline taxes. We believe the state of Kansas should adopt the federal transportation laws in regard to portable fuel containers. We oppose the diversion of state highway trust funds to offset budget deficits. Cooperatives create and continually re-create communities. The unique character of cooperatives is that they put the social well-being of their members and communities on par with their economic well-being. 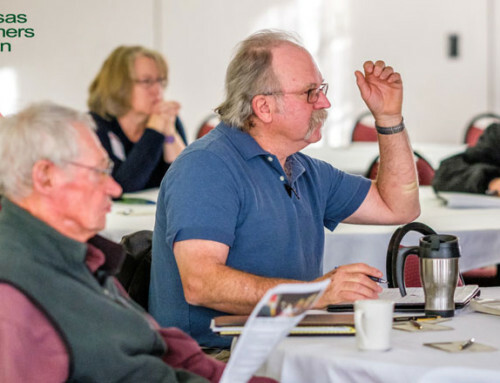 Agricultural cooperatives should be further strengthened in the American farming system to enable farmers to achieve greater bargaining power both in marketing and purchasing. Farmers Union opposes any attempt to interfere with the present capital structure of the cooperative and its present tax status. We are opposed to any co-op manager or non-members serving on the board of directors of our local or regional co-ops. We support current legislation that requires 10 members to form a co-op. We oppose the distribution of severance pay to board members, chief executive officers, and other executives due to mergers or acquisitions. We oppose changing regulations that require a two-thirds (2/3) vote of members to change the articles of incorporation. We oppose planned entry into livestock breeding and feeding facilities which will place our cooperative into a vertical integration position. We must not use our cooperative’s resources in any way which creates direct competition or weakens our membership’s financial well-being. We support the Rochdale Principle (one member/one vote). We strongly oppose any cooperative entity from creating an alliance with any company that intends to control the market. We urge the Kansas Legislature and U.S. Congress to provide assistance in funding a program to provide information, consultation and referrals to rural residents. We support locally-owned and operated value-added endeavors. We also call for the rejuvenation of a rural development initiative for the benefit of the local community. We support federal and state infrastructure funding based on a priority of need rather than the ability to provide matching funds. We support maintaining rural post offices. We urge the Kansas Legislature to conduct public hearings on income and wealth disparity, in order to devise equitable tax policy. We urge passage by the Kansas State Legislature of a law to prohibit entry into business of farming and ranching or the ownership of agricultural land by alien investors, except those resident farm families or individuals seeking United States citizenship. We urge passage of legislation strengthening the reporting of Kansas agricultural land owned by aliens, corporations, and/or limited partnerships. We urge the Kansas legislature to investigate the establishment of a state bank of Kansas modeled after the State Bank of North Dakota. We support the system of independent rural banks and credit unions. We urge those banks to support Kansas family farmers and to serve the credit requirements of Kansas family farmers. We favor the same regulations for savings and loans. We support fairness in real estate transactions, and are not promoting an increase in taxation. We support reform in the banking industry. We support the Dodd-Frank Wall Street Reform and Consumer Protection Act and Glass-Steagall Act. We oppose the Riegle-Neal Interstate Banking and Branching Act, which mandates that an out-of-state bank be allowed to purchase banks across state lines without regard to individual state law. We support state legislation to opt-out of the interstate branching provision of the Riegle-Neal Interstate Banking and Branching Act. State legislation should prohibit speculation in the futures market by grain elevator owners and operators, except in the case of legitimate hedging. State legislation should also prohibit involvement by elevators in delayed or deferred pricing schemes. Grain elevator operators should be required to submit more detailed financial information to the Kansas Grain Inspection Department. We support timely and in depth audits. We support the acceleration of the receivership process for financially troubled elevators, with provision for a temporary receiver to be named ensuring immediate supervision of a bankrupt elevator to guarantee that grain is protected while the courts appoint a permanent receiver. We support farmers being given priority through “farmers first lien” in elevator bankruptcy proceedings. We oppose the grain warehouse trust fund concept funded by a check-off assessed against grain sold by farmers. We endorse a federal or state insurance program protecting any stored and/or priced grain for all state and federally inspected elevators, similar to the federal deposit insurance corporation for banks. Warehouse receipts and scale tickets shall be recognized as legal proof of ownership of grain and should be guaranteed by the government. We support similar protection for the sale of livestock through public auction. We support the concept of initiative and referendum which allows our citizens to vote on major issues and to initiate ballot questions by petition. We encourage all eligible citizens to register and vote. We oppose efforts to enact restrictive voter identification requirements. We support the concept of a Secretary of Agriculture appointed by the Governor and confirmed by the Senate. We support strict regulation and public disclosure of any Kansas-grown pharmaceutical GMOs. All field research sites of such GMOs must be approved and have permits issued by the KDA. Our communities are in need of developing a more diverse agricultural system and access to healthy food. We support further development and expansion of specialty crop production and marketing will help address this critical need. We support development and expansion of industrial hemp production in Kansas. We oppose the “patenting” of life forms. Kansas seed law should not restrict producers of wheat, barley, oats, soybeans or alfalfa from replanting or selling seed produced on their farms. We oppose any efforts to introduce or allow the use of the “terminator gene” on our nation’s seed supply. We urge the establishment of mandatory livestock brand inspection at all markets. The 2018 adjustments Congress made to the Dairy Margin Protection Program (MPP-Dairy) program by adjusting margin calculations and lowering premiums have helped struggling dairies. However, an adequate safety net must remain the goal for federal dairy policy. Congress and the administration must act to protect more dairy farmers from going out of business. We support a budget resolution to increase spending for an adequate dairy safety net; programs that account for actual costs of production; exploring incentive-based inventory management programs; Ad hoc disaster assistance; and trade policies that don’t disadvantage American dairy producers. We support a floor on the basic formula price, i.e., the base price for determining the milk price for producers. We support the use of the marketing order system in Kansas to effectively set a floor on dairy prices paid to the dairy farmers. We support an appeal process for the American dairyman when an inspection is considered unjust by the farmer. We oppose the practice of tail-docking on dairy cattle. We oppose the elimination of the state’s Meat and Poultry Inspection Division. We oppose any legislation that would discontinue the current practice of county noxious weed departments selling, distributing and applying pesticides, herbicides and other chemicals. We recommend industries, which are heavy users of water, be required to use surface water instead of ground water, and to recycle, when possible. We urge that all oil and natural gas producers be prohibited from using fresh water in flooding for secondary oil recovery (hydraulic fracturing). We oppose the use of any Kansas water for the transportation of coal slurry. We strongly urge that present irrigation practices and future development conform to strict conservation principles to assure the wisest use of water to minimize the possibilities for adverse environmental and economic impact on affected communities. We recommend any multi-year variable groundwater rights program include a mandatory reduction in total allocation as a conservation measure to offset potential unintended consequences. We recommend that all wells have meters. We oppose the transfer of surface or ground water from one watershed to another, including the transfer of water from the Missouri River. Water and wind rights must not be severed from surface ownership. We support flood control by the use of area watershed projects as opposed to large general dams. We support continuing tax benefits to remain in effect on lands with donated easements for the entire life of both new and existing structures. We support state funding and technical assistance for soil and water conservation practices. The Kansas Farmers Union is opposed to costs for power generating facilities under construction being added to current utility rates. We oppose the taking of private property without due process. We oppose granting eminent domain power for private profit, including foreign entities. We oppose the use of eminent domain by the department of wildlife and parks to acquire land that has been cultivated for more than 10 years, that has been designated wetlands. Preservation of agricultural land should be given priority in all zoning decisions. Required appointment on zoning or planning boards for farmers, assuring them representation on a par with non-agricultural interests in the region. We support legislation that allows farmers a voice in establishment of new game or predator species in their area. We require the Kansas Department of Wildlife, Parks and Tourism to notify the public of any previous or future releases. We support landowner’s rights to convey conservation easements in perpetuity. The need to take action on preserving pollinators is urgent. We support improving pollinator health and habitat. We urge strong private and public efforts to take action to protect pollinators through habitat protection and expansion. We also support reducing the systematic use of neonicotinoids. We urge strong public and private efforts to reduce emissions of heat-trapping gases and toxic pollutants from all sources. We support research for climate change adaptation. We strongly support programs promoting regenerative agriculture as a means for farmers to receive compensation for agricultural practices maximizing sequestering atmospheric carbon dioxide in agricultural soils. This puts farmers at the forefront of not merely coping with a continually deteriorating global climate, instead, restoring earth’s natural climate systems. Immigrant labor is an important factor in agricultural operations. We recognize the need for specialized labor in agriculture, and support efforts to improve the process for such employment while insuring dignified and just treatment of employees.